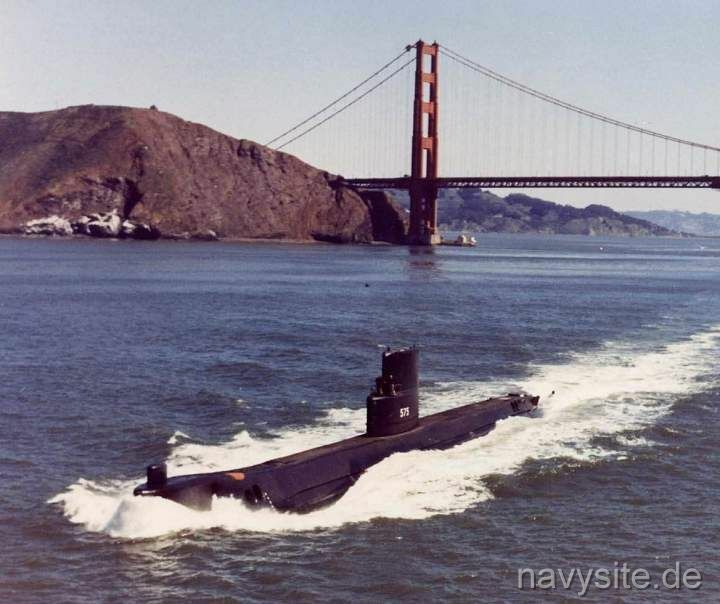 USS SEAWOLF was the Navy's second nuclear-powered attack submarine and the first submarine to be equipped with a S2G sodium-cooled nuclear reactor. But due to the difficulties of running a sodium-cooled reactor, the Navy decided to replace SEAWOLF's sodium-cooled reactor with a water-cooled one and use only water-cooled designs in the future. The conversion of the reactor was conducted from December 12, 1958 thru September 30, 1960, at Electric Boat Division of General Dynamics Corporation, Groton, CT. Although fully armed, the SEAWOLF mainly served as a test platform. In 1968, the submarine got the classification "second-line submarine" and continued its trials duty. The SEAWOLF was for example used for suitability tests with small submarine rescue vehilces including the DSRVs. Decommissioned after 30 years of service on March 30, 1987, the SEAWOLF was stricken from the Navy list on July 10, 1987. The submarine spent the following years at the Puget Sound Naval Shipyard, Bremerton, Wash., until SEAWOLF entered the Navy’s Nuclear Powered Surface Ship and Submarine Recycling Program there on October 1, 1996. Recycling was completed on September 30, 1997. This section contains the names of sailors who served aboard USS SEAWOLF. It is no official listing but contains the names of sailors who submitted their information. 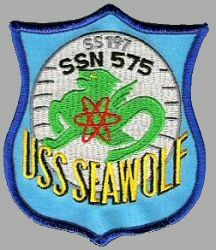 Click here to see which USS SEAWOLF memorabilia are currently for sale on ebay. August 19, 1956 Groton, Conn. The experimental sodium-cooled nuclear reactor of USS SEAWOLF suffers a failure in the steam plant during a full power test run while the submarine is at Groton, Conn. A leak of sodium-pottasium alloy being used as the third fluid in the steam generator aggravates stress corrosion in the system, causing two cracks in steam piping and a leak in a superheater. Makeshift repairs allow the SEAWOLF to complete her initial sea trials on reduced power in February 1957. Due to the difficulties of running a sodium-cooled reactor, the Navy decides to replace SEAWOLF's sodium-cooled reactor with a water-cooled one and use only water-cooled designs in the future. January 30, 1968 approx. 65 miles east of Cape Cod, Mass. 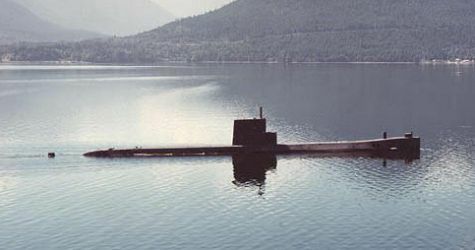 USS SEAWOLF runs aground while submerged and damages her rudder. There are no injuries and the SEAWOLF returns to Groton, Conn., for repairs. USS SEAWOLF suffers a breakdown in the engineroom main drain while en route to the Pacific. The SEAWOLF surfaces dead in the water and calls for assistance. The USS BLANDY (DD 943) gets underway to the SEAWOLF and tows the submarine. The next day the SEAWOLF is able to correct the problem herself and gets underway under her own power for Guantanamo Bay.